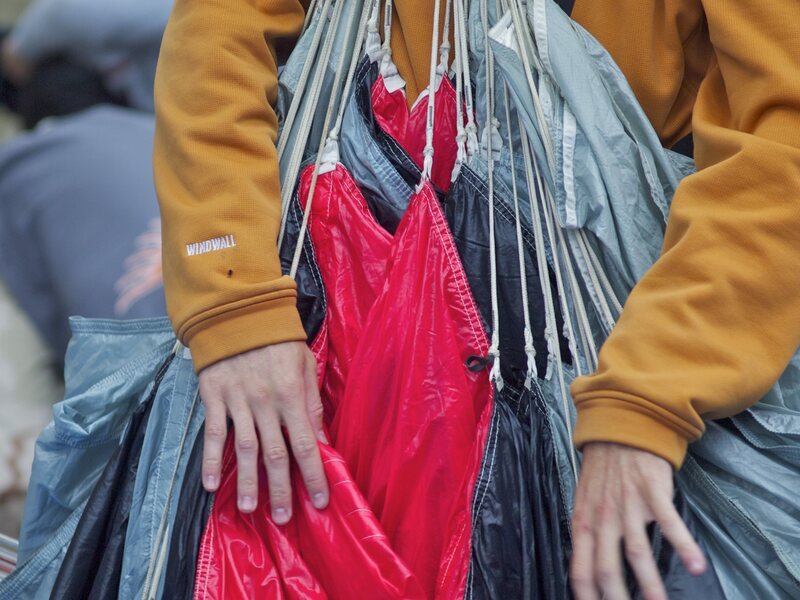 A BASE jumper carefully refolds his parachute for another jump. I finally made it to Bridge Day, the one day BASE jumping festival at the New River Gorge bridge in Fayetteville, West Virginia. My dad grew up in Fayetteville and I’ve been hiking and climbing at the gorge on many occasions. I always seem to be elsewhere in October, so this was my first Bridge Day. The experience was much like skydiving was for me: once was probably enough. I’m not an extreme athlete but I’ve been to a few extreme sports festivals, the Ouray Ice Climbing Festival in Ouray, Colorado and the New River Rendezvous, also in Fayetteville, to name a couple. My favorite thing about climbing festivals is meeting the athletes, talking to them about their passions, and getting travel tips for the best places to watch the pros. 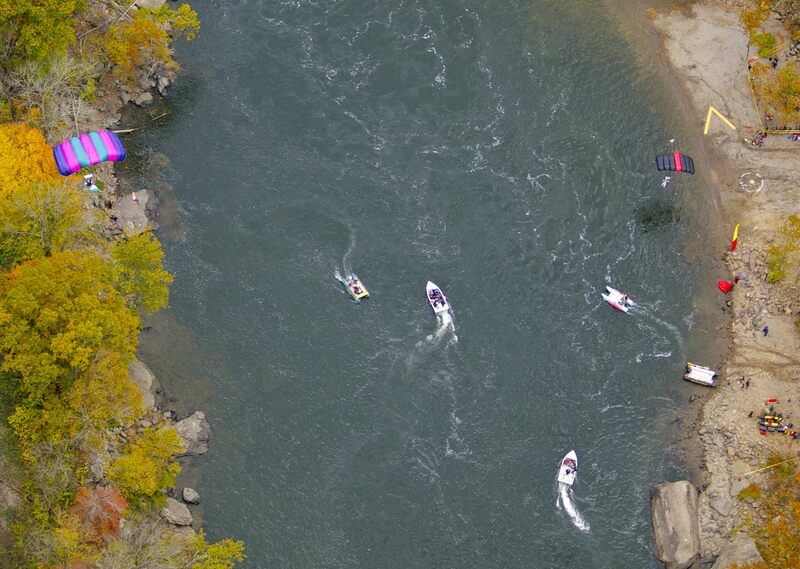 BASE jumpers parachute to the bank of the New River. In more than 1,000 jumps, only 103 people landed in the water, where they were quickly picked up by rescue teams in boats. I think this is what I missed most about Bridge Day: talking to the jumpers. The way the bridge was set up, it was very hard to get close enough to the participants to actually talk to them. I wanted to ask where they were from, how many prior base jumps they had done, how many times they were hoping to jump that day, where their dream jump destination might be. Unfortunately, as soon as I fought my way through the crowd to where the the jumpers were lined up, I was told by a very imposing police officer to move along. Lesson learned: next time, get a press pass. I did manage to get a couple of shots of jumpers repacking their parachutes. I love these! Such a delicate procedure and it really shows in their careful hands. If there is a next time, that is. Watching the jumpers leap, flip and dive off the New River Gorge Bridge was a thrill; my feet tingled every time I saw somebody take the plunge. But glimpses of the daredevils were few and far between. By far, the vast majority of my time at Bridge Day was spent fighting through the crowd of 100,000 people, many of whom seemed less interested in the jumpers than the gauntlet of food trucks lining the bridge. 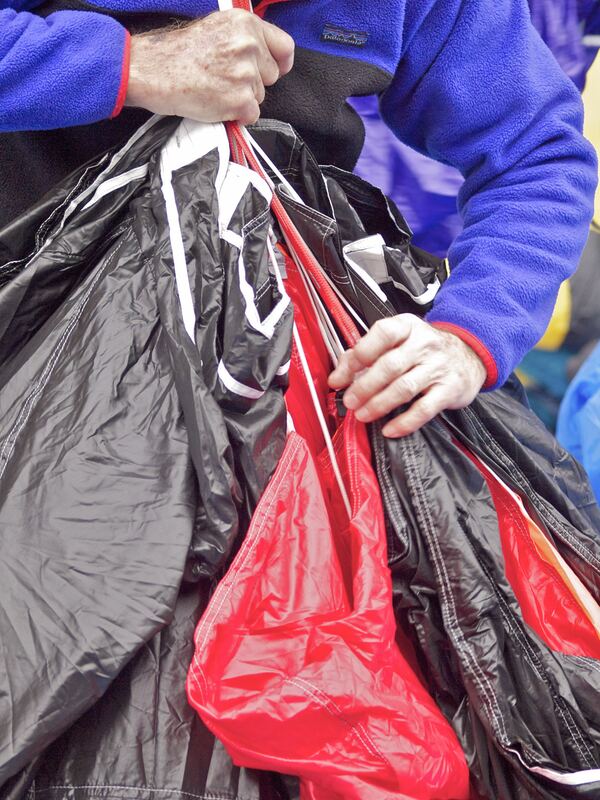 • 450 jumpers from 41 states and 10 countries made 1,036 jumps in 6 hours. 0 parachute failures and only a handful of relatively minor injuries (I saw one guy land in the trees, ouch!). 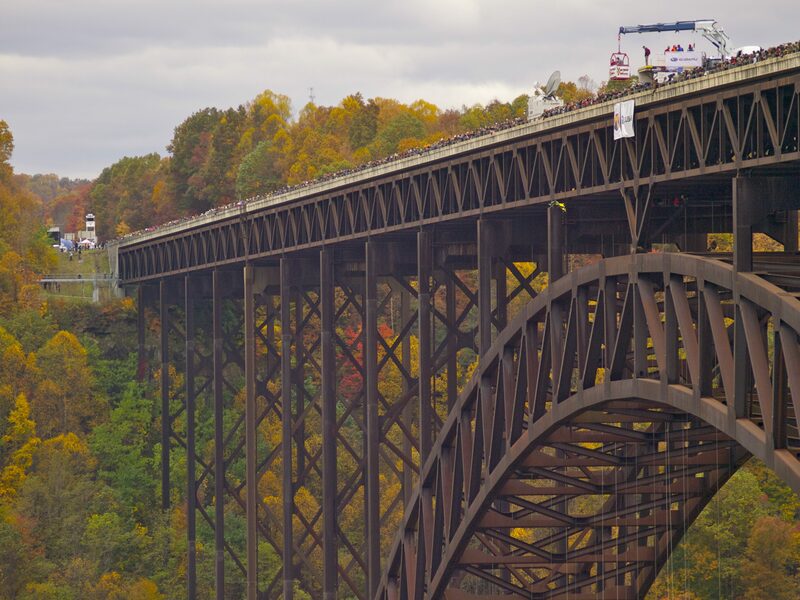 • 17% of those jumping at Bridge Day 2012 were making their very first BASE jump! To qualify to jump at Bridge Day you need a minimum of 100 jumps from an airplane. • 131 jumpers landed in the cold waters of the New River instead of on shore. All were quickly rescued by EMT’s in speed boats. • 10% of the 450 jumpers were women and only 3 were from wild, wonderful West Virginia. Would I ever BASE jump? No way in hell. I went skydiving once and absolutely hated the free fall part of the jump. Once the parachute came out, I loved the sensation of floating, but the fall itself was horrifying. Never again. Next time I get the urge to fly, I’ll try paragliding or hanggliding. Jumping from 13,500 feet. Commence free fall freakout in 3…2…1. Photo by Skydive Orange. Check out my 2008 skydiving video here. 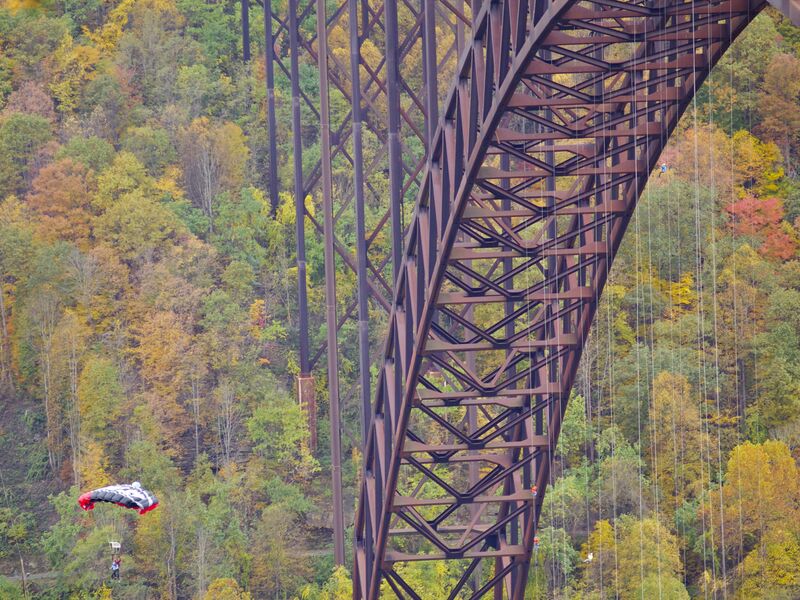 This entry was posted in Photography and tagged BASE jumping, Bridge Day, Fayetteville, New River Gorge. Bookmark the permalink. That must be one of the craziest things I’ve ever seen! Only a 10% mislanding rate? Amazing! such a beautiful fall day you had there. BTW, Shenandoah was incredible last week. Best year ever !